It seems like most commentators are comfortable seeing the Olivette Discourse (Matt. 24:3-25:46; Mk. 13) as referring in its first half to the destruction of Jerusalem and then in the later half to the end of days parousia of Jesus. In Matthew, one stretch that seems somewhat divisive is 24:29-31. “Immediately after the tribulation of those days the sun will be darkened, and the moon will not give its light, and the stars will fall from heaven, and the powers of the heavens will be shaken. Then will appear in heaven the sign of the Son of Man, and then all the tribes of the earth will mourn, and they will see the Son of Man coming on the clouds of heaven with power and great glory. And he will send out his angels with a loud trumpet call, and they will gather his elect from the four winds, from one end of heaven to the other. In particular, the most controversial aspect of these three verses is the epic apocalyptic scale of what is being described. "Tribulation," "sun will be darkened," "moon will not give its light," "stars will fall from heaven"... Most people outside of the Jewish first century culture would see a pretty huge stretch between a city being demolished and these sorts of images being fulfilled. As a consequence, a large number of commentators include verses 29-31 in the second half of the Olivette Discourse and say that this is imagery of Jesus' eventual parousia, visitation, or coming (pick your favorite translation). "And on that day," declares the Lord GOD, "I will make the sun go down at noon and darken the earth in broad daylight." When I blot you out, I will cover the heavens and make their stars dark; I will cover the sun with a cloud and the moon shall not give its light. All the bright lights of heaven will I make dark over you, and put darkness on your land, declares the Lord GOD. All the host of heaven shall rot away, and the skies roll up like a scroll. All their hosts shall fall, as leaves fall from the vine, like leaves falling from the fig tree. These are only a few examples, and I am sure there are even more occurrences like this in the Old Testament, but I think these should suffice to prove my point. My point is that none of these texts are referring to the eschaton at the end of the age when Christ returns. All of these verses are using this epic imagery to refer to God's judgment on specific cities. The passage in Joel refers to a judgment upon Israel; the passage from Ezekiel refers to a coming judgment upon the Pharaoh of Egypt; Isaiah 13:10 refers to coming destruction on Babylon; and finally, Isaiah 34:4 referred to a coming judgment upon Edom. R.T. France, in his commentary on Matthew, points out that these last passages from Isaiah are obviously the source of the imagery which Jesus uses in Matt. 24:29-31. In particular, the fact that Jesus would use the language of a judgment upon Babylon to refer to a coming judgment upon Israel was terribly offensive. To say that Jerusalem deserved to be treated like Babylon was the epitome of judgment. What do you make of the similarities between 1 Thess. 4:13-18 and Matthew 24:19-31? Could this be an indication that the NT authors understood Jesus' spoken words to be about the 2nd coming? "For the Lord himself will descend from heaven with a cry of command, with the voice of an archangel, and with the sound of the trumpet of God. And the dead in Christ will rise first. 17 Then we who are alive, who are left, will be caught up together with them in the clouds to meet the Lord in the air, and so we will always be with the Lord." Angels, trumpets, the gathering of the elect, Christ in the clouds, etc. I would also point out that the sounding of the trumpet is often associated with the resurrection in the pseudepigrapha. I once charted out all of the echoes of the Olivet Discourse in the rest of the NT. I could email you the chart if you so wished. These echoes suggest that Jesus' sermon was influential in shaping the eschatology of the rest of the NT. This is especially telling when you consider that the most of the NT was written prior to the writing of the gospels. This means that these echoes come from the memory of Jesus’ own teaching and not just from the evangelists. This makes a preterist reading of Matthew 24:29-31 unlikely, since it is obvious that the early church understood Jesus’ sermon to be about the end of the world, and not just the destruction of the Temple in AD 70. I would tend to agree with you that there are similarities. However, similarities do not necessarily reflect an actual allusion. In addition, when you consider that ALL of these images in Olivette were borrowed from the OT, it seems very difficult to conclusively know whether it is Olivette or Isaiah which is being echoed by Paul in the passage you've cited. There are a couple of differences in the 1 Thess. passage that I would draw attention to. -The additional discussion of a general resurrection which is absent from Matt. 24:29-31. -The notion of being caught up to meet Jesus (in the supposed parallel in Matthew, it is the angels who are gathering the elect, not the Lord Himself). In either case, I don't want to start hair splitting. You've given me something to think about, for sure. "This verse makes us reflect on the very little that the New Testament has to say about the manner of the Parousia. Nowhere else have we as full a description of what is to happen as here, but the details are few, and do not paint for us a very full picture." I think that Jesus hints at resurrection when he mentions a trumpet call. In the Pseudepigrapha, the trumpet is associated with the final resurrection of the dead. The Apocalypse of Ezra 4:36 reads, "After these things a trumpet, and the graves will be opened and the dead will rise up uncorrupted." This connection between a trumpet's call and the resurrection is confirmed in early Christian writings (1 Cor. 15:52; 1 Thess 4:16; and Didache 16:6). Well... admittedly in the NT context it often does, and even sometimes in the OT, but not always. The four verses I mentioned before (Ex. 19:16, Isa. 27:13, Joel 2:1, and Zech. 9:14) do not appear to be connected with resurrection, for example. Though it is clear that sometimes it is connected with resurrection. So the question really comes down to where Paul is getting his imagery from. Considering that Paul knows the OT inside and out and knew it by heart before he even became a Christian, it is impossible, in my opinion, to separate his words in 1 Thess. 4 from the OT occurrences of these same images and contexts. It would be possible to show concurrence between Paul and Olivette, but it seems like a whole other beast to show that Paul is actually depending upon the Gospel tradition instead of the very familiar OT occurrences. But Exodus 19:16 and Isaiah 27:13 are about the gathering of the elect. A concern for both Paul and Jesus. 1 Thess 5:6 echoes Jesus' call to watch and be sober for his return (Matthew 24:42). 1 Thess 5:4 uses Jesus' "thief in the night" imagery (Matthew 24:43). 1 Thess 5:3 uses Jesus' reference to birth pangs (Matthew 24:8). 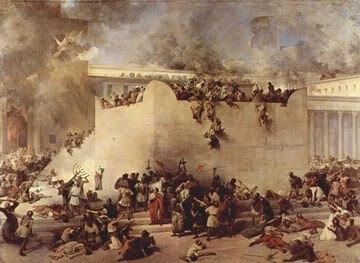 2 Thess 2:4 refers to the desolation of the temple (Matthew 24:15). So if we look at the trumpet reference in isolation, it's hard to prove a connection between Matthew 24 and 1 Thessalonians. But if we look at it as a whole, it's probable that Paul is familiar with Jesus' sermon and is drawing from it in the Thessalonian correspondence. Of course, these connections might be scattered throughout the OT as well. But all of this imagery is found in Matthew 24. This makes Paul's use of Matthew 24 all the more probable. I don't disagree with your suggestion that Paul is dependent on the OT for his use of the "trumpet" image. I would just say that Paul is dependent on the OT here, because Jesus is dependent on the OT.